Camping is one of our family’s favorite ways to relax and spend time together during the summer. There is no pressure to go see the sites or keep rushing around to accomplish a to-do list that feels like it is a mile long. You can do things at your leisure the whole time, there truly is no schedule. 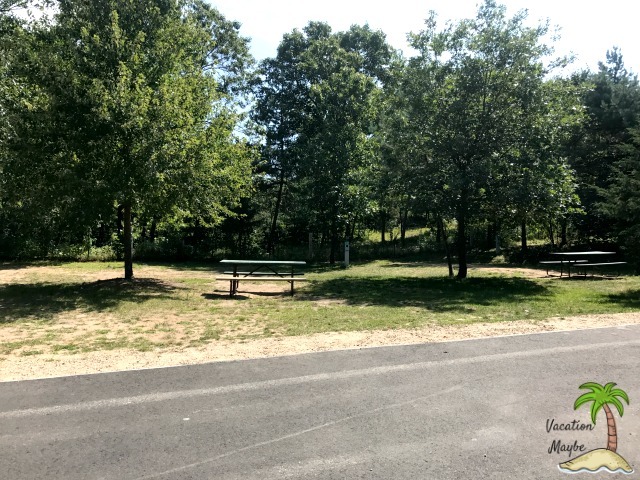 Smokey Hollow Campground is the perfect place to unwind as a family. Smokey Hollow Campground is located in Lodi, Wisconsin. They offer many different types of rentals to stay in. If renting cabins or campers (or other unique rentals) isn’t your style there are also tent sites and sites for your personal RV as well. Each weekend throughout the summer boasts a special theme. Many of the provided activities revolve around these themes. All rental sites have water and electric. They also all come with a grill and a fire pit. It is a park policy that you buy your wood within the park and do not bring your own. 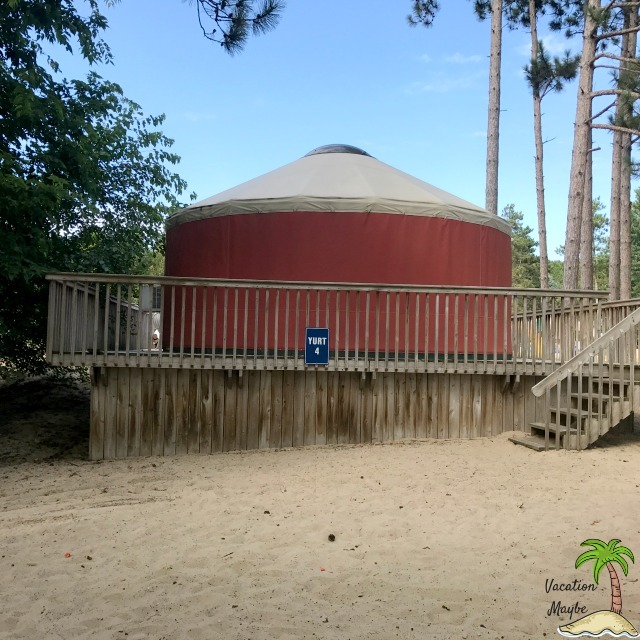 The yurts are located right off the swimming pond. They are one big circular room. While they look like they might be on the smaller side from the outside, don’t be fooled: they are very roomy. They offer a kitchen area but, no bathroom. Being by the beach though you are close to both the bathrooms at the store and port-a-potties. 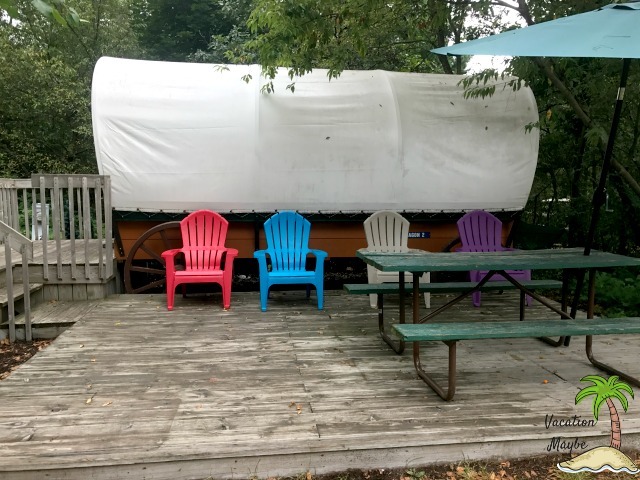 The covered wagons are on the smaller side but, make for a very unique experience while at Smokey Hollow Campground. These do not offer bathrooms but, there are bathrooms close by. 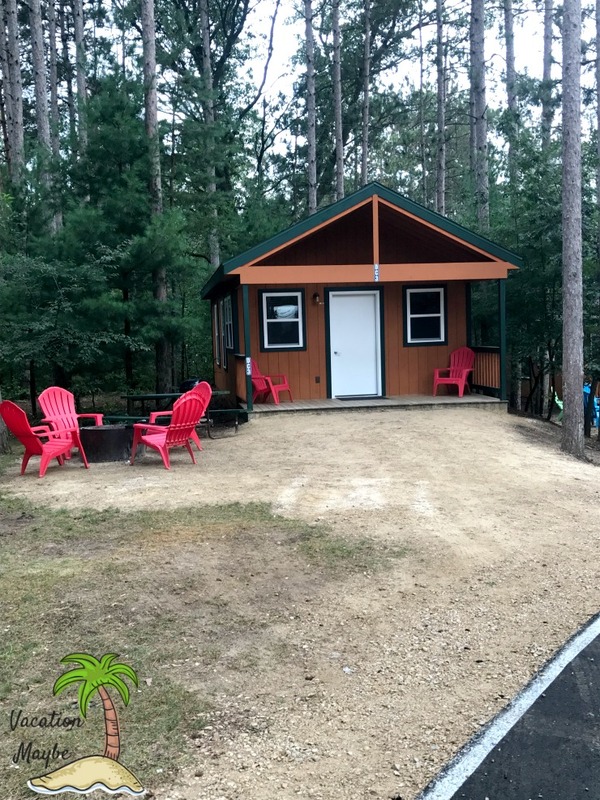 The deluxe cabins are the most popular rental at Smokey Hollow. They offer plenty of room and a bathroom. There are several campers available to rent as well. There are a couple different areas of Smokey Hollow where there are tent sites. You can get individual sites or, they offer a couple of group sites as well. 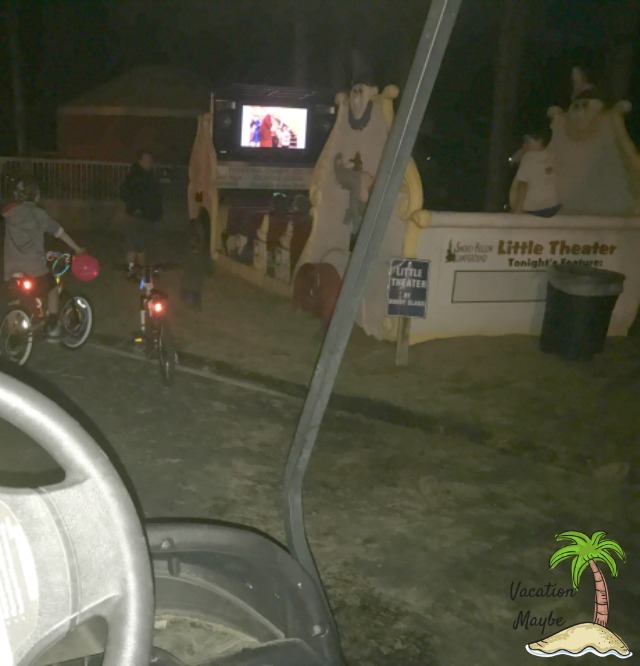 During your stay you are able to rent a golf cart to get around the campground. You can rent them daily or, for the whole weekend. There are port-a-potties located all over the campground. They were the cleanest ones I have ever been around. Not once it ever smell gross or have that well known “port-a-potty scent”. Several times a day I saw someone cleaning them out. If you prefer, there are also bathrooms with running water and flushing toilets up by the store as well. Smokey Hollow offers free wifi within 20-30 feet from the store. The password is posted in a few different places so you can easily sign in. Right next to the registration office there is a store that offers a wide range of items. Their prices are fantastic compared to many places we have stayed. While you can get necessities like ice, coffee, soda, adult beverages, non perishables and wood, you can even find some unique items in the store. I was very please with how reasonable the prices were for most items. You can order food from the kitchen located in the store and have it delivered for free to your campsite. The menu has a good variety of items and the prices are pretty reasonable. The pond is the swimming area at Smokey Hollow. It is surrounded by a sandy beach. My first thought was a squirt guns and water balloons fight. I was surprised when they brought out a trailer equipped with a fire hose. They sure pull out the big guns for this one! Water balloons and squirt guns are allowed too! This was so much fun to watch. 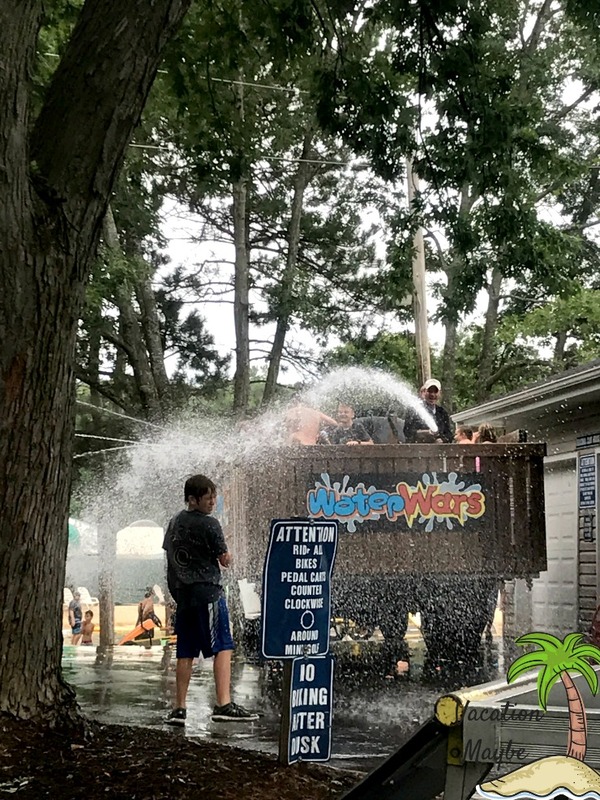 My kids didn’t want to get wet but, even my husband got involved in this one. 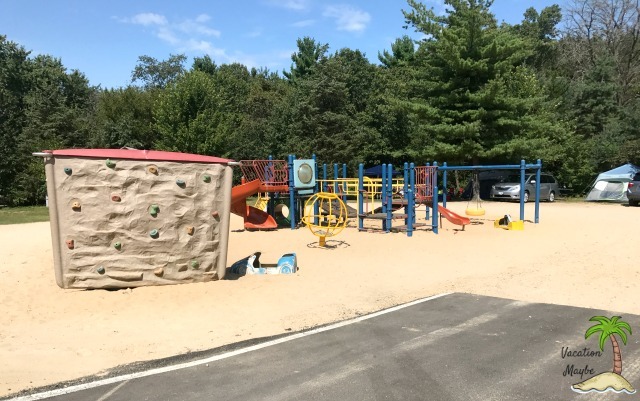 There are a few different types of playgrounds located in different areas of the campground for your kids to enjoy as well. This one is weather dependent but, was one of our favorite things to do while we were there. You are even able to pull up your bikes and golf carts to watch as well. When we first pulled up our 8 year old was surprised to see a “huge chess game”. She was so excited to check it out. This was one of the first things she checked out. You can purchase a VIP wristband in the office at any point during your stay and it is good for your entire stay. The wristbands give you unlimited access to several of the activities. There are several different types of bikes that are available to ride during daylight hours. All you have to do is go into the store, check out a flag and you can ride as long as you want. This was by far, our kids most favorite activity. 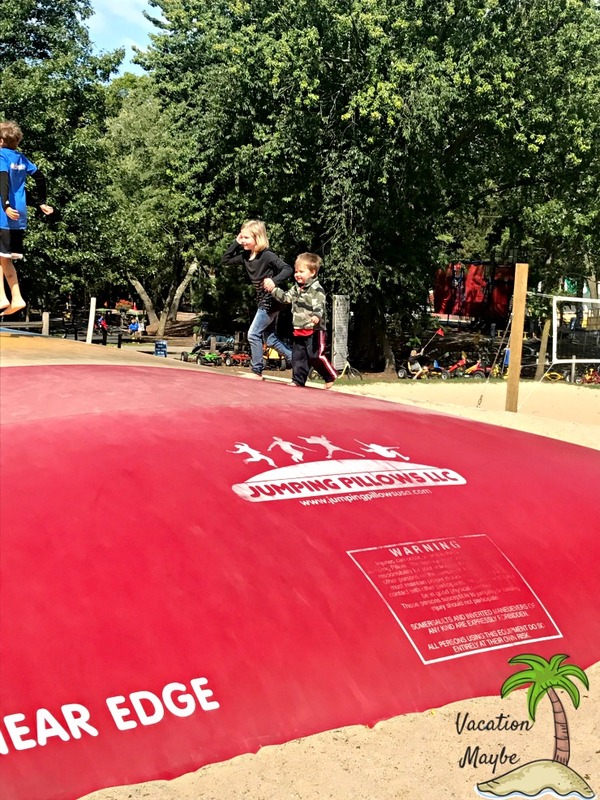 It is open all day long and kids can jump as long as they want. During the weekend there is an all you can eat Ice Cream Social located behind the store on the patio. On Friday nights, adults can play Bunco for a small admission fee. 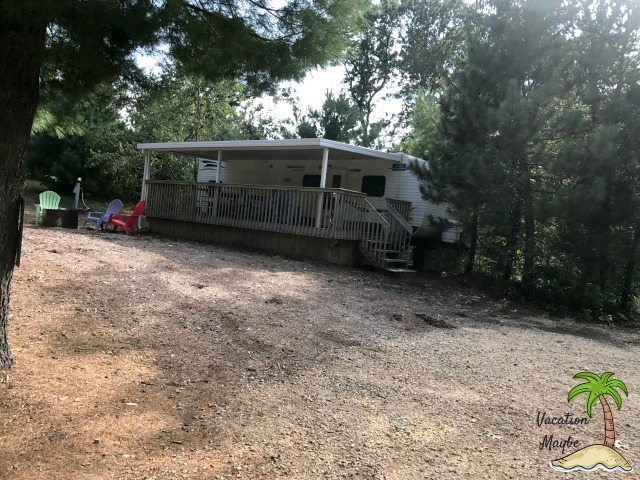 There are so many things that I just didn’t have room to list in this blog post but, I can promise you that no matter where you are coming from, that Smokey Hollow Campground is well worth the visit. The staff is amazing and everyone we encountered was warm and welcoming. 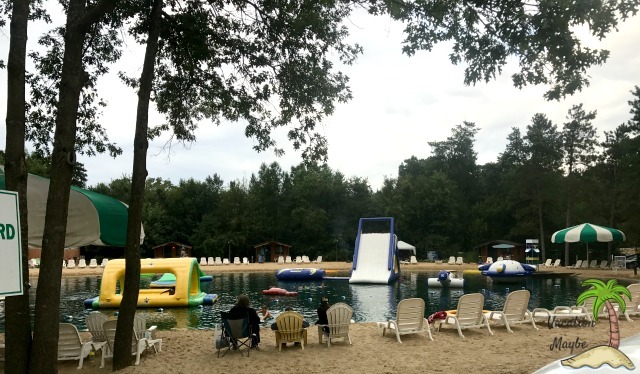 There are many other activities close by for the family to enjoy but, there is plenty to do at Smokey Hollow Campground to keep everyone busy for the duration of your stay. We cannot wait to visit again.